The orchid season and the mass flower display has almost finished, but some earlier flowering species may be hanging on if we have had a wet spring, particularly the triggerplants. 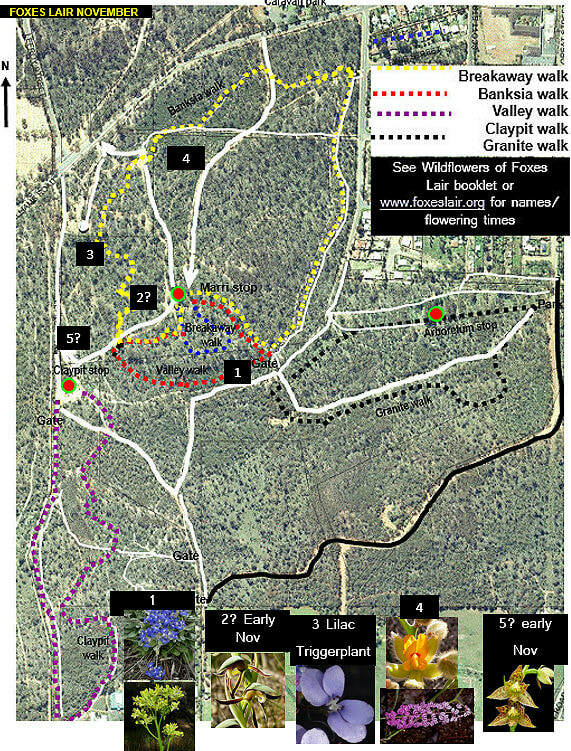 The western part of the Banksia Walk, and the flat spot north of the claypit (look for Leopard Orchids in early November) will have the greatest number of wildflowers. Blue Dampiera eriocephala and yellow Common Popflower on the Breakaway Walk are also particularly attractive. The Valley walk tends to be cooler in the daytime. If the claypit has water, it is froglet time there. The tracks are great for a walk or cycle in the early morning and evening. There is a good chance of seeing our kangaroos at this time when walking or driving through slowly. check out flowering mallees at the Arboretum.